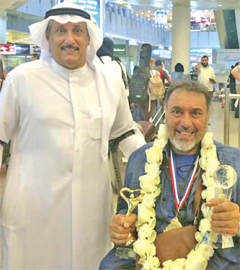 KUWAIT: Kuwait Disabled Sports Club lauded the achievement of Kuwait’s formative artist Naji Al-Haii at the London innovative Arabs gathering, which witnessed the participation of a large number of Arab innovators in many fields. KDSC Secretary General Abdallah Al-Azmi, during the reception of Artist Al-Haii, that his win of two prizes, the first for his work through competing with other artists, and the second was in appreciation of the organizing committee of the winning work. Al-Azmi said, the club under the leadership of Shafi Al-Hajiri is keen on supporting its members in all fields and allow them to innovate, and asked all disabled innovators to utilize their energy to hoist Kuwait’s flag high in the field of formative arts. He dedicated this achievement to HH the Amir Sheikh Sabah Al-Ahmad Al-Jaber Al- Sabah and Kuwait people.